Until this decade there was no substantial evidence of hominids in Europe before about 0.5 mya. Discoveries at the Gran Dolina site in the Sierra de Atapuerca, Spain, have radically altered the fossil hominid record in Europe. Fossils and stone tools at least 780,000 years old, and possibly older, were reported in the Journal Science in 1995. The initial announcement of the finding included the indication of a possible new species, an ancestor to the Neanderthals. 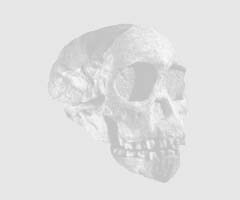 In May of 1997, again in Science, the new species, Homo antecessor, was published. The Atapuerca discoveries refute the earlier hypothesis that humans reached Europe near 500,000 years ago. The human fossils and lithic industry were found in association with fauna at a level dated before 780,000 years ago, and the remains were found in stratigraphic context. The Gran Dolina has been a rich resource for fossils for a century. The Sierra de Atapuerca is dotted with limestone caverns and breccia with fossils. In 1976 human fossils were found in the Sima de los Huesos, at the base of a 13 meter deep shaft deep inside Cueva Mayor. In 1983 a sample from Sima de los Huesos yielded three human teeth among many bear remains. In 1984 systematic excavation began, and bear and human fossils were found. By 1997 over 1600 human remains had been excavated, representing at least 32 individuals, the largest repository of fossil humans from the Middle Pleistocene. Most of these have been found in Sima de los Huesos. They include a complete skull and several other crania. The excavation has just begun, and most of the human fossils remain to be excavated. The Sima de los Huesos human fossils occupy an important period of human evolution. Neanderthal and modern human ancestors were evolving while Homo erectus persisted in East Asia. The Sima de los Huesos evidence contributes to knowledge of human evolution and the paleobiology of a Middle Pleistocene. The Sima de los Huesos human fossils exhibit a unique combination of cranial, mandibular, and dental traits. The fully modern midfacial morphology antedates other evidence of this feature by 650,000 years. The authors of the species suggest that Homo antecessor may represent the last common ancestor for Neanderthals and modern humans (Bermúdez de Castro, et. al., 1997). The midfacial topography shows a fully modern pattern. The supraorbital torus is double arched. The cranial capacity is over 1000 cc. The mandible is thinner than that of H. ergaster and H. habilis. The postcanine teeth are smaller than in H. habilis, within the range of H. ergaster, H. erectus and H. heidelbergensis. 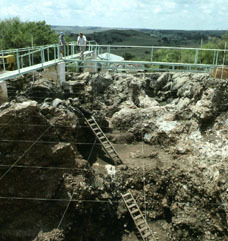 Ideal dating materials, such as volcanic rocks, are lacking at Atapuerca. The first dating was paleomagnetic, derived from the periodic shifts in the earth's magnetic field evidenced in rock. These determined that the Sima de los Huesos human remains predate the last major reversal in the geomagnetic field direction, at 780,000 years ago (Parés, et. al., 1995). In 1999 electron spin resonance (ESR) and Uranium-series results on teeth from the Gran Dolina deposit confirmed the paleomagnetic dating (Falguéres, et. al., 1999). These together indicate that TD6, the Aurora strata (which contain the H. antecessor remains), dates to between 780,000 to 857,000 years ago. The paleoenvironmental record suggests that TD6 correlates to oxygen isotope stages 21 or 19. The combined US-ESR age estimates indicate human occupation from about 800,00 to 300,000 years ago. The findings at Gran Dolina has resulted in reevaluation of suspected Lower Pleistocene sites elsewhere in Southern Spain (Palmqvist, 1997). 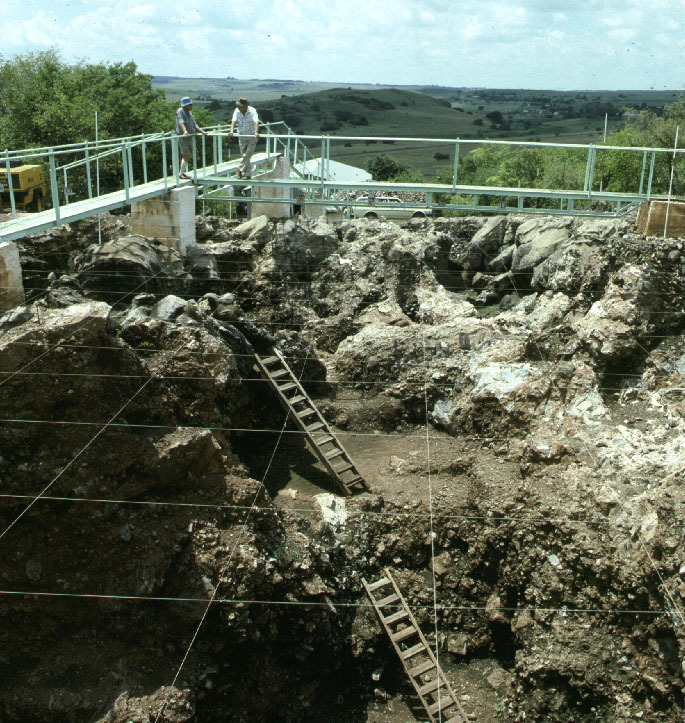 View of the Sterkfontein excavation. Similar conditions and geology prevail at Sterkfontein and the Gran Dolina, limestone formations with fossils embedded in breccia. However, the Sima de los Huesos is buried deep in a cave in the Sierra de Atapuerca and is located at the base of a deep well-like shaft, compounding the difficulties of excavation. Click on the images for a larger views. Photo courtesy IHO/Kimbel. Arsuaga, J. L., I Martinez, A García, J. M. Carretero, C. Lorenzo, N. García and A. I. Ortega. 1997. Sima de los Huesos (Sierra de Atapuerca, Spain). The Site. Journal of Human Evolution 33:109-127. Bischoff, J. L., J. A. Patrick, L. Léon, J. L. Arsuaga, J. J. Bahain and T. Bullen. 1997. Geology and preliminary dating of the hominid-bearing sedimentary fill of the Sima de los Huesos Chamber, Cueva Mayor of the Sierra de Atapuerca, Burgos, Spain. Journal of Human Evolution 33: 129-154. Carbonell, Eudald, Marina Mosquera, Xosé Pedro Rodríguez and Robert Sala. 1995. The First Human Settlement in Europe. Journal of Anthropological Research 51:107-114. Carbonell, Eudald, Montse Estaban, Aurora Martin, Marina Nájera, Marina Mosquera, Xosé Pedro Rodríguiz, Andreu Ollé, Robert Sala, Josep Maria Vergés. 1998. The Pleistocene site of Gran Dolina, Sierra de Atapuerca, Spain: a history of the archaeological investigations. Journal of Human Evolution 37:313-324. Gutin, JoAnn C., 1995. Remains in Spain Now Reign As Oldest Europeans. Science 269:754-755. Palmquist, Paul. 1997. A critical re-evaluation of the evidence for the presence of hominids in the Lower Pleistocene times at Venta Micena, Southern Spain. Journal of Human Evolution 33:83-89. Parés, Josep M. and Alfredo Pérez-Gonzalez. 1995. Paleomagnetic Age for Hominid Fossils at Atapuerca Archaeological Site, Spain. Science 269:830-832.